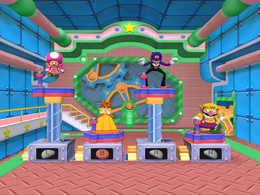 Same is Lame is a 4-player minigame in Mario Party 6. The player runs across the area, jumps down a small set of stairs, and then on to the podium. The view then changes to the one shown in-game. In this minigame every player has a podium to stand on. During each round, players have five seconds to press the , , , or buttons. If the results show that a player's choice is different than the others, that player's podium rises. Nothing happens to any players that have pressed the same button. As long as there is time left during the round, the players may change their choice by pressing another button. The first player to choose a different button three times wins, though multiple players may win. The losers' (or loser's) platform(s) head back down to the bottom as the camera zooms in on the winner(s). A spotlight then shines on the winner(s) and confetti rains down on them as they perform their victory animation(s). In some cases, losers can be seen doing their losing animation(s). Rules – "Choose a button to press. If you're the only player to choose that button, your platform will rise. Raise three levels to win!" Advice – "You can change your button choice as many times as you want before the timer runs out." This page was last edited on January 16, 2018, at 13:08.